Every pottery studio needs gadgets. Working can be made much more enjoyable if you have the right gadgets. Pottery studio gadgets can help make your environment livelier and make tasks easier to complete. 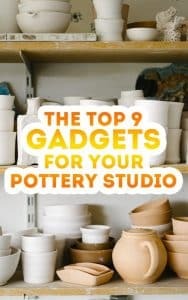 The following 9 pottery studio gadgets that can be used in your potters’ studio, and are very helpful to making working in the studio less laborious, and enlighten your day and mood in your pottery studio. In conclusion, even though there are not many gadgets that can be used in the studio comparatively to offices or college there are still many that can assist potters in the studio. We hope these gadgets listed above can hopefully significantly improve your time in the studio and give you ideas for other potentially useful gadgets to add to the studio. If you have discovered other gadgets that are helpful to you in the studio then please share with us in the comments below!